I’ve looked high and low for a Candy Corn Cookie Cutter. I scoured every craft store, baking department, grocery store and beyond. I gave up, and made these instead! Just as soon as I did . . . I found a Candy Corn Cookie Cutter! It’s o.k, they were fun to make. I ran out of daylight hours before I snapped pictures though . . . that leads to poor pic’s. The “how to” for these cookies is on the Betty Crocker Website, and you are suppose to use their Sugar Cookie mix. I happened to have (1) package of that Sugar Cookie mix . . .and it’s fast & easy. I also linked to this video, and it shows you in detail just how to make them. I watched . . . and went to work! After making the sugar Cookie dough, just divide it in 3 equal balls. Leave one ball white . . . Color one ball bright orange . . . the other ball Yellow. Take a loaf pan, and line it with foil or Saran Wrap. I decided that the saran wrap was much easier. 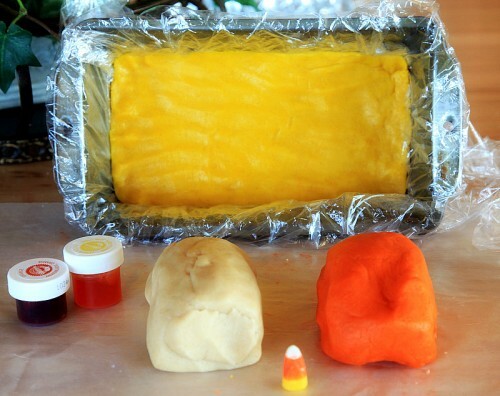 Roll the Yellow sugar cookie dough out to be approximately the size of the loaf pan. Repeat the process with the Orange then the white. Once you’ve placed all 3 layers in the loaf pan . . . Cover it with the sides of the foil or Saran Wrap. Chill it, until it’s very set. I actually placed mine in the freezer for a faster solution. Now make yourself some 1/4 inch thick Slices . . . like this. Now for the fun part . . . Make your Candy Corn Shapes. Just make Diagonal cuts back and forth. They are really just bite size Candy Corns . . . so darn cute. Lay them out on a Silpat or Parchment Paper. Bake in a preheated 350 degree oven. My little cookies only needed 5 to 6 minutes. 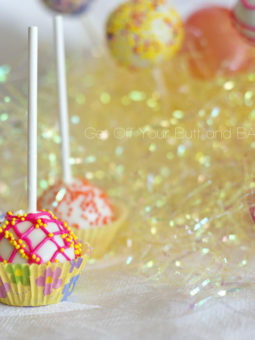 Decorate them with a Drizzle of Confectioners icing or Cream cheese frosting and a few sprinkles. I also made another homemade recipe for Sugar Cookies. 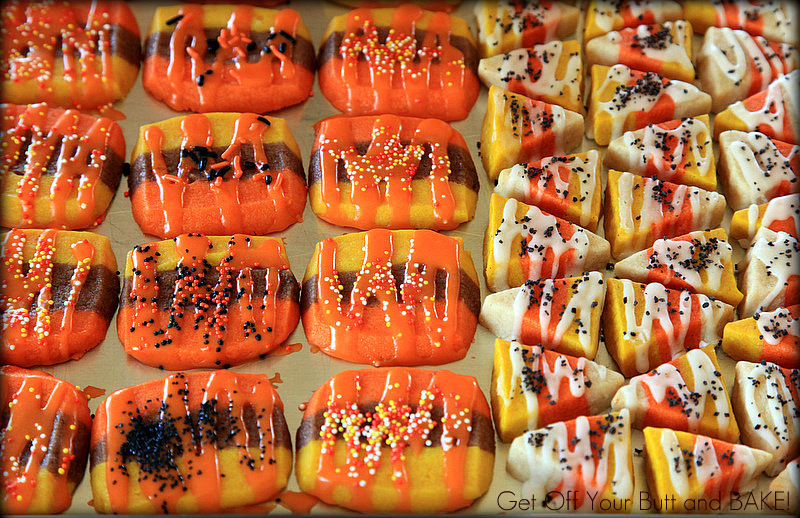 This time, I colored my dough Orange, Yellow and Chocolate! Simply melt about 1/4 cup of semi sweet chocolate Chips and work as much as you like into one of those Sugar Cookie balls. Layer the Orange, Chocolate and yellow into your loaf pan . . . just like you did before. Unwrap the chilled dough, and you will see something like this. I started out making little bars, but decided they were a bit too large. I simply cut them in half . . . like this. Bake them at 350 for about 6 minutes, or until just barely starting to brown around the edges. Keep covered in a Well sealed Container. They are even better the 2nd day. To be very honest, the Betty Crocker Sugar Cookie Mix, was just as good as the homemade dough! Don’t eat too many or you’ll turn into one of these! 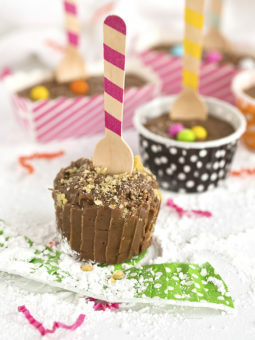 Here is another great recipe. *Remember that the homemade recipe will make more dough than 1 mix will. 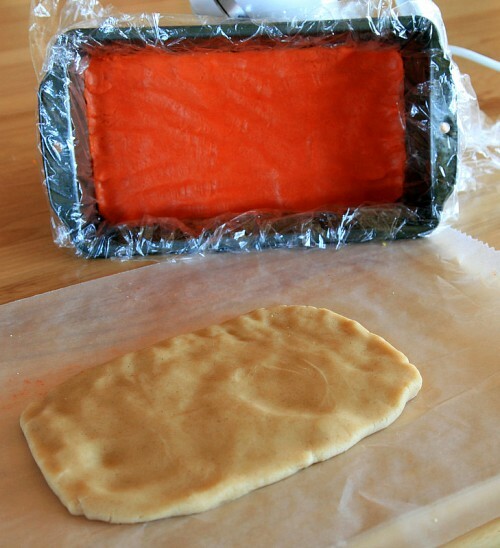 Each layer should fill the size of your loaf pan, and will be about 1/2″ thick. Just eat the rest of the dough . . .it’s good! 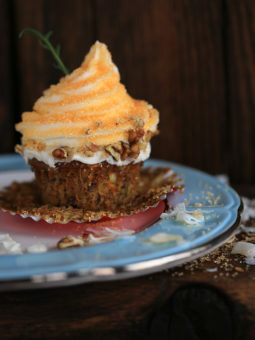 *For the Sweet Drizzle, I just made the Cream Cheese Frosting, and added extra milk to thin it down. In a large bowl, cream together the butter and sugars for 3-4 minutes, until the mixture is light and fluffy. Add the eggs one at a time, mixing well after each addition. Add vanilla extract, almond extract and lemon zest; mix. Add two cups flour, baking powder and salt. Mix. Add remaining flour and mix just until flour is incorporated and the dough is smooth and soft. The dough can be wrapped in plastic wrap and kept in the refrigerator for up to a week or it can be rolled out right away. Dust a counter with powdered sugar or flour and roll the dough to desired thickness (I prefer my cookies on the thick side so I roll my dough out to about 1/4-inch, maybe even slightly thicker than that). Cut the dough into shapes. Place the cookies on a lined or lightly greased baking sheet. Bake for 7-8 minutes. The cookies won’t appear browned on top (or on bottom) when they are done baking so don’t let them overbake! I find 7 1/2 minutes is about perfect but if they are even lightly browned on bottom, I decrease the time by 30 seconds. I like them super soft with not even a hint of browned edges or bottom. This way they literally melt in my mouth. 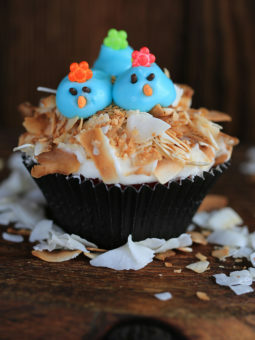 These are my two favorite Sugar Cookie Frostings…..they are both good. The first one isn’t quite as sweet. *Note: the key to success here is using really soft cream cheese and beating it with the powdered sugar until no lumps remain. In a large bowl, combine the softened cream cheese, powdered sugar, salt and vanilla. Mix until very smooth and light and no lumps remain. In a separate bowl, beat the cream to stiff peaks. Add the whipped cream to the cream cheese mixture. Mix until well combined and smooth. Store in the refrigerator for up to one week.